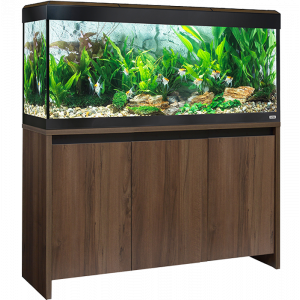 The Fluval Roma 240 tank is a rectangular aquarium designed on clean, simple lines to bring sophistication to modern home décor. Also with the Roma 240 tank there are holes in the bottom for the external filter to save having pipes going over the back. 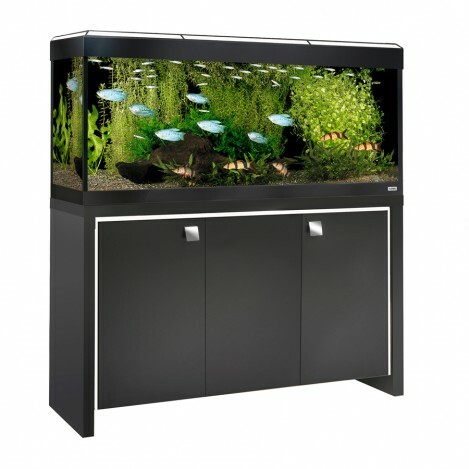 The tank contains a fluval 306 external filter, double light unit with two glo T8 light tubes, fluval heater, LCD thermometer, and a care guide. The Roma range also has a stand available, the stand is a stylish design with integral storage. 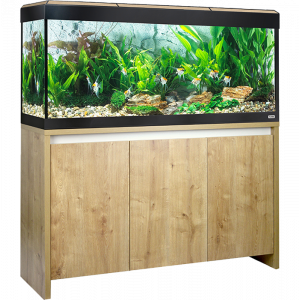 The Roma 240 Cabinet features a cutaway section for the under tank filtration connection. Stand colour:- Oak with black inserts or black with white insert. NEW colour now available Dark Wood. The new style Stand also comes with no handles. Stand size:- W120 x D40 x H73cm. We sell the external filters but there only available in store.